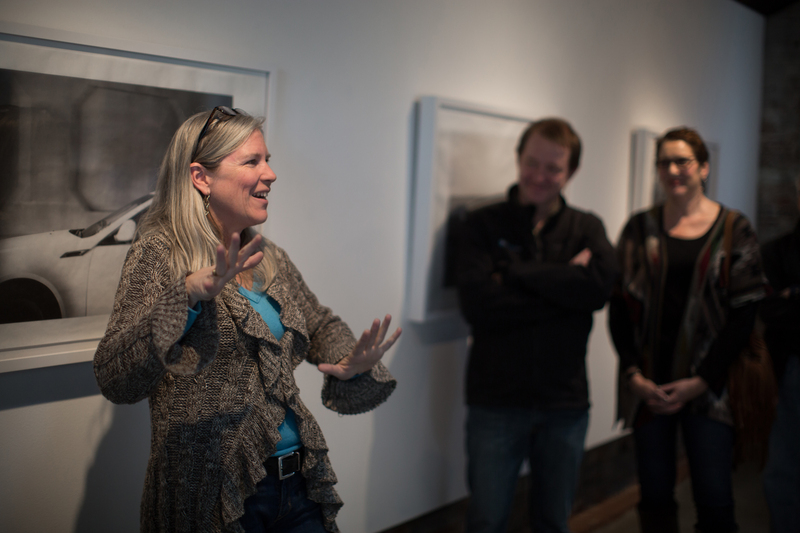 This past weekend Beth Lilly held an engaging talk at Whitespace. In order to convey her inspiration for her current show, A Moving Image of Eternity, Lilly briefed her audience on her childhood and adolescent years. Just as she was entering her teenage years, Lilly and her family moved from Atlanta to Snellville, Georgia. Laughing, she explained how the drastic change from constantly being surrounded by friends to suddenly being completely isolated in middle-of-nowhere Georgia drove her a little crazy. The climax of her story, though, came when she was finally old enough to drive. Lilly found solace on Georgia’s interstate roads. Suddenly, she was removed from the seclusion of her family home in Snellville. Lilly explained how her hours spent driving led her to understand the concepts of human restlessness and the constant yearning for change. The interior of her car felt familiar and still, like her inner conscience. Her exterior environment, however, was in constant motion. During her drives, Lilly was accompanied by many other cars—all individuals sharing a common motive to move. Her four current photo series, featured at Whitespace through February 14th, recall Lilly’s experiences and thoughts from her countless drives. “Lost in Thought”, a nine piece series, nicely demonstrates how Lilly translates her beliefs about the human condition of restlessness to her photography. Each photograph involves a clear image of an individual or individuals totally absorbed in their conscience. The stillness of the vehicle they are in represents this intimacy. The blurred background of their exterior environment is a portrayal of restlessness and change. In order to capture these particular images, Lilly set her camera lens on a slow shutter speed. The camera was set up on a tripod in the passenger seat of her car and faced out the window. Lilly scouted the cars surrounding her for interesting subjects as she drove on the interstate roads of Atlanta. Once she determined a subject, she would drive alongside the car and use a handheld remote to take photographs with her camera. Lilly also slyly mentioned that her camera lens hid the flash as she snapped a photo, so drivers around her would not know if or when their image had been captured. Since the camera was moving at the same speed as Lilly’s subjects when the photographs were taken, the subjects and their cars appear sharp in the final image. The surrounding environment, however, was whizzing by as the camera captured the image, so every other aspect of the photograph appears blurred. This technique is called panning. Lilly explains how these nine photographs suggest a departure from reality. This concept is enhanced by the blurriness and black and white print of each final image. Each photograph is printed on Kozo paper, a type of Japanese tissue paper. Kozo is made up of strongly bonded fibers that do not absorb the ink of the image; instead, the ink remains on the surface. Each image appears to lightly float atop the surface of the Kozo paper—further communicating a fleeting moment in time that is subject to change. The additional three photo series featured in Lilly’s current exhibit at Whitespace display equally unique, and sometimes humorous, approaches implemented by Lilly in her endeavor to capture and communicate the inevitable states of the human condition. This entry was posted in Uncategorized on February 6, 2015 by blog814.